Are you a habitual snorer? If so, you should find an anti-snoring device that works for you. Some of the devices you can use include snoring mouthpieces, nasal strips, sprays, chin straps, and more. At the end of this SnoreMeds review, you will know whether the snoring mouthpiece is right for you. Let’s get started. SnoreMeds is a Class II FDA-approved jaw retaining mouthpiece. Class II medical devices are those that require a prescription before purchase. SnoreMeds is FDA-approved, which means its safety and performance has been tested and ascertained. Although SnoreMeds has a similar design like other mandibular adjustment devices, it is more affordable and comfortable to wear. SnoreMeds is made from materials that are recommended and approved for use on oral devices. 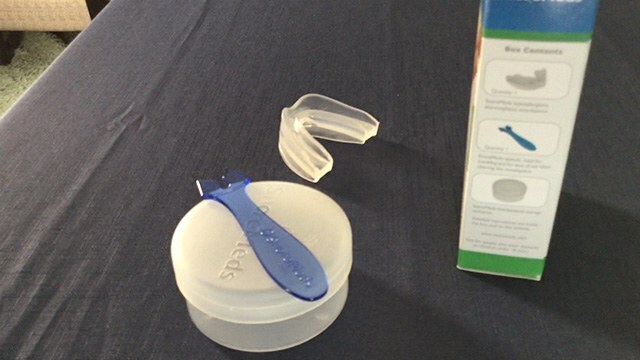 The snoring device is made from BPA-free material. Therefore, the device can be used by sensitive people. The best thing about the design of SnoreMeds is that it can be personalized for your mouth. 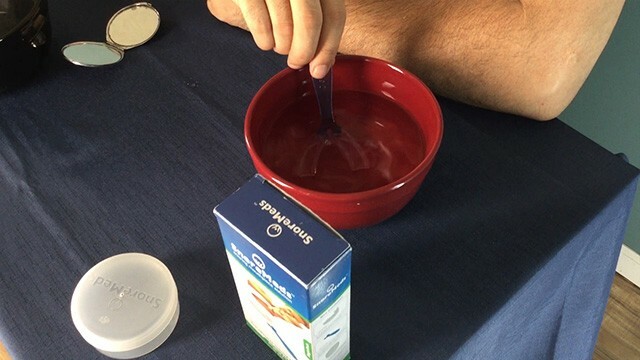 Doing this requires the use of boil and bite technology that has also been used by other thermoplastic MAD devices. 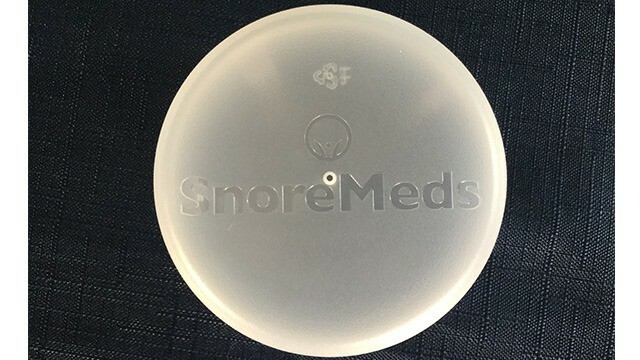 SnoreMeds snoring mouthpiece has two separate airholes at the front that help mouth breathers. You can personalize the mouthpiece to fit your teeth perfectly and, therefore, help to reduce and eventually stop snoring. SnoreMeds is one of the top-rated snoring mouthpieces on the market. You can personalize the mouthpiece to conform to the unique arrangement of your teeth. This customization makes the anti-snore device popular and effective. The boil and bite technology is not a unique feature with SnoreMeds; it is used in many MADs. 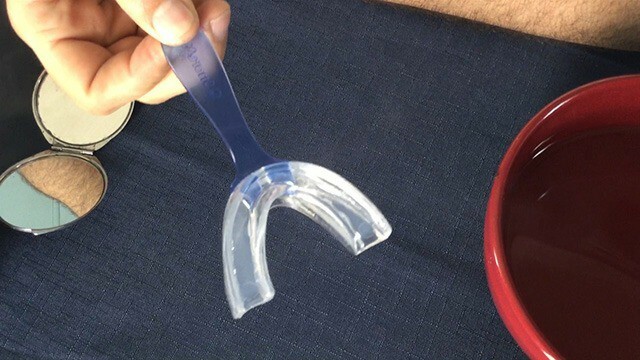 However, many people find it challenging to customize their mouth guards through the instructions that the MADs come with. 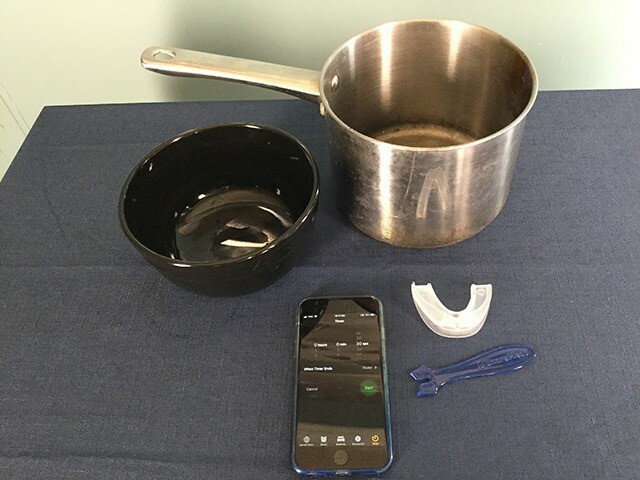 With SnoreMeds, you don’t have to worry about molding as the device is designed to be customized to fit your teeth. When molding the snoring mouthpiece, you will have to set the lower jaw advancement. Therefore, practice moving the jaw forward before you start the molding process. If you don’t get the mold right, you will have to repeat the whole process. However, repeating the process also reduces the strength of the clay mold. With SnoreMeds mouthpiece, you can only mold it twice. The best thing is that when you mold correctly, your device will fit you properly. Below are the steps to customizing the mouthpiece. ii) Take the snoring mouthpiece and insert the spatula on the holes in the front. iii) Hold the spatula and insert the mouthpiece into the hot water for 15 to 20 seconds. The mouthpiece will become clear. From here, the mouthpiece will be soft and easy to mold. Therefore, make sure you bite properly to make a good impression. 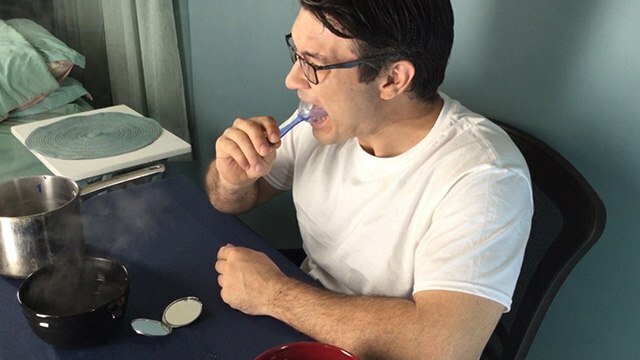 iv) Stand in front of a mirror and carefully place the mouthpiece in your mouth (using the spatula) on the lower jaw first and then on the upper jaw into position. vi) Press outside of the mouthpiece from front to back using your fingers. vii) Use your tongue to push the back of the mouthpiece forward to remove any trapped air for a tight fit. 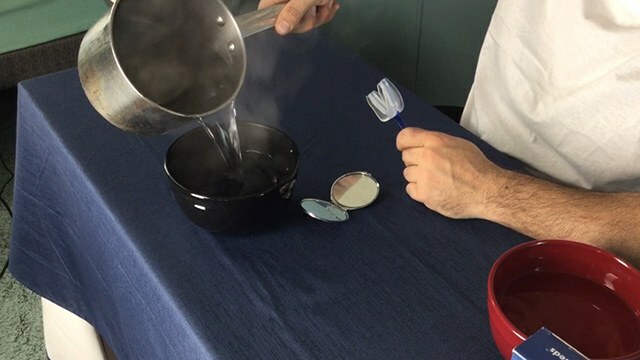 viii) After getting your impression, place the snoring mouthpiece in cold water to set it. It is important to properly clean your mouthpiece to ensure it stays in good condition. 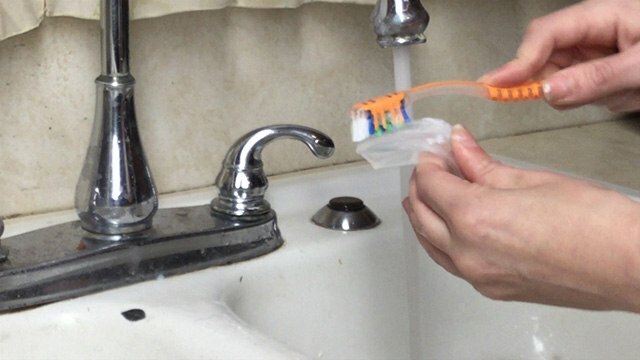 You can clean the mouthpiece using mouthwash, toothpaste, and a denture cleaner like Dental Duty. According to the manufacturers, you should use the molding spatula to clean. Cleaning the mouthpiece is easy since there are not many holes in it. Ideally, you should clean your SnoreMeds device, dry it and then store it in its anti-bacterial carrying case. Read this guide for more detailed molding instructions. SnoreMeds works in a simple way; it tries to get your body functioning properly when you are asleep. When you are awake, all your body systems; the muscles around your throat, the nasal opening and the airflow passage; automatically work perfectly to maintain a balance of air inflow and outflow pressure. When you sleep, you become unconscious and things change. Since your body is relaxed, the throat muscles collapse and get in the way of the air passageway. The narrowing of the throat under these circumstances increases the pressure of the air you breathe and this makes the soft tissues to vibrate. This vibration produces a sound that is known as a snore. When you wear SnoreMeds when sleeping, it holds the lower jaw in a forward position to keep the air passage wider. This prevents the tissues from vibrating against each other. This method has been clinically tested and proven to be effective. The method has been used by dentists since the 1980s to help reduce chronic snoring. 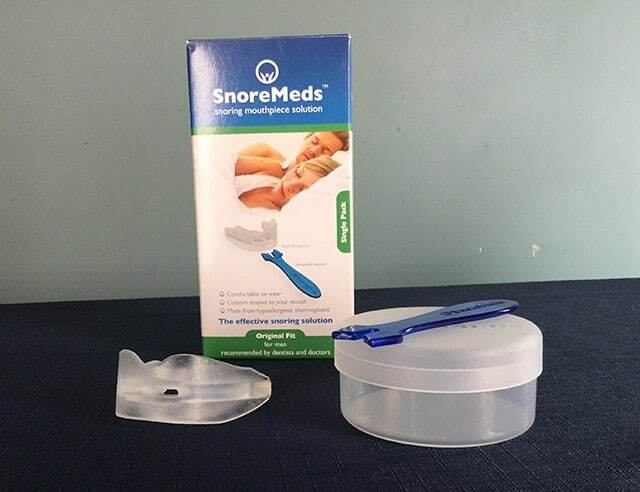 SnoreMeds stop-snore device comes in a regular and small size. The regular size is recommended for men and the small size for women. However, the size of your jaw and arrangement of your teeth should guide you on the mouthpiece to purchase. For example, a woman with large teeth but a smaller mouth should choose a regular size mouthpiece as it is likely to fit more perfectly. There is no much difference in the price of the different units. NB: The shipping cost is 4.50$ and is often applied at the checkout. Click here for all pricing information. We recommend you purchase the Single Pack that goes for $46.95 for a start. When you use the device and find that it works, you can then purchase the Value Pack that goes for $94.95. The technology used by SnoreMeds, holding your lower jaw in a proper posture, helps to control and eventually eliminate snoring. SnoreMeds is safe to use, even by latex-sensitive people, as it is latex- and BPA-free. Moreover, all materials used to make the snoring mouthpiece have been approved by the FDA. Therefore, you shouldn’t worry about any health issues emerging. One advantage that SnoreMeds has over other snoring mouthpieces is affordable but just as effective as other more expensive options. None of the SnoreMeds mouthpieces cost over $100. Check all the current prices here. Buying multiple SnoreMeds mouthpieces provides more value than buying one. However, the price of one device is still affordable compared to other snoring mouthpieces in the same category. Making an impression for a customized SnoreMeds mouthpiece is relatively easy. Moreover, the device comes with a spatula to use for cleaning and when boiling to make an impression. Inexpensive and offers great value, especially if you buy the Double or Value packs. Like most devices, SnoreMeds is not completely flawless. For example, you may experience some pain in your mouth during the first few nights of wearing the device. However, the pain will progressively decrease with every night you wear the snoring mouthpiece. Moreover, SnoreMeds does not last for very long. Generally, you should replace your device after every four months. The good news is that you’ll get a 33% discount on your replacement purchase. Finally, the molding can only be done twice. Generally, SnoreMeds works and will help to stop you from snoring. Many people are happy with the device. Check what users are saying here. SnoreMeds is a decently priced anti snoring mouthpiece that works. The snoring guard stops snoring resulting from blockage of the nasal passage and vibration of throat tissues against each other. SnoreMeds is relatively affordable and can be used by people age groups. You can purchase SnoreMeds from the official website here.